Deputy Fire Chief Robert Shinske insisted he crashed this city-issued fire vehicle into his Dearborn house. For more on this story, tune into the Muckraker Report on 910AM today from 11-noon. Embattled Deputy Fire Chief Robert Shinske, who was suspended for five days for driving his city-issued SUV to a bar in October, has crashed the vehicle under suspicious circumstances. 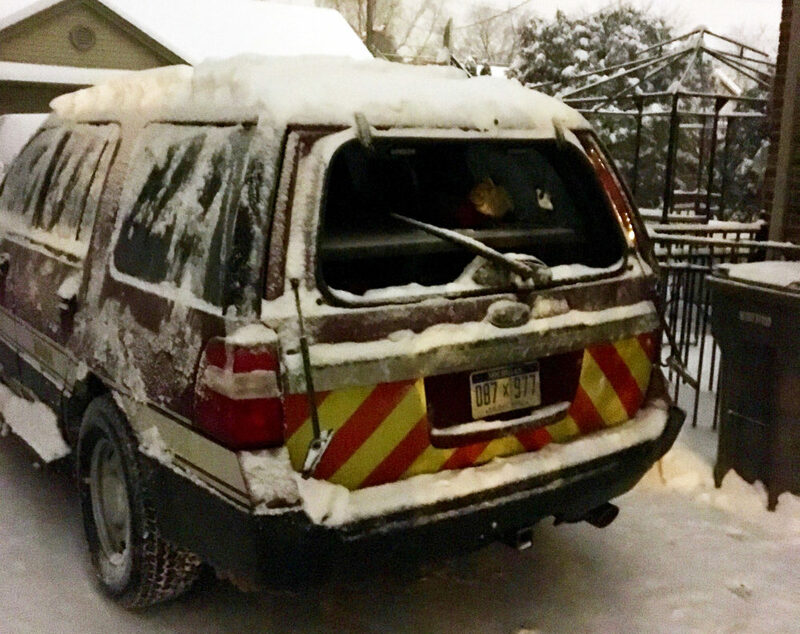 Just after midnight on Thursday, Shinske alerted a senior fire chief that he had crashed the city’s SUV into his Dearborn home, smashing out the rear window and brake light, and causing damage to the back bumper. From the road, there is no visible damage to Shinsk’e house. What happened next has raised eyebrows in the fire department. When a fire vehicle is crashed, the driver or senior chief is required to notify central dispatch to ensure a proper investigation is done. Dispatchers would alert fire officials and immediately call for an official photographer to document the crash. That never happened. Nor was Dearborn police contacted because the crash allegedly occurred on private property. But because some of the protocols weren’t followed, the shop waited hours before handling the crashed SUV. Nevertheless, Fire Commissioner Eric Jones is standing by his No. 3 in command, saying Shinske took a drug and alcohol test and “wasn’t drunk.” But Jones declined to say how much time passed between the alcohol test and the accident. Shinske hasn’t been suspended during the investigation as required by department protocol, and he has received a new city-issued SUV. As Motor City Muckraker reported earlier this week, Shinske was suspended in October after citizen journalist Alex Haggart posted photos of the deputy chief’s vehicle at a Dearborn bar, where surveillance video appears to show him staggering. According to two fire department sources, including an arson investigator, Shinske urged arson chief Patrick McNulty to investigate Haggart for a number of unfounded allegations. Shinske and McNulty are friends and graduated from the same fire academy in the 1980s. The resulting investigation was so weak that the Wayne County Prosecutor’s Office declined to file unidentified charges against Haggart less than a week later.